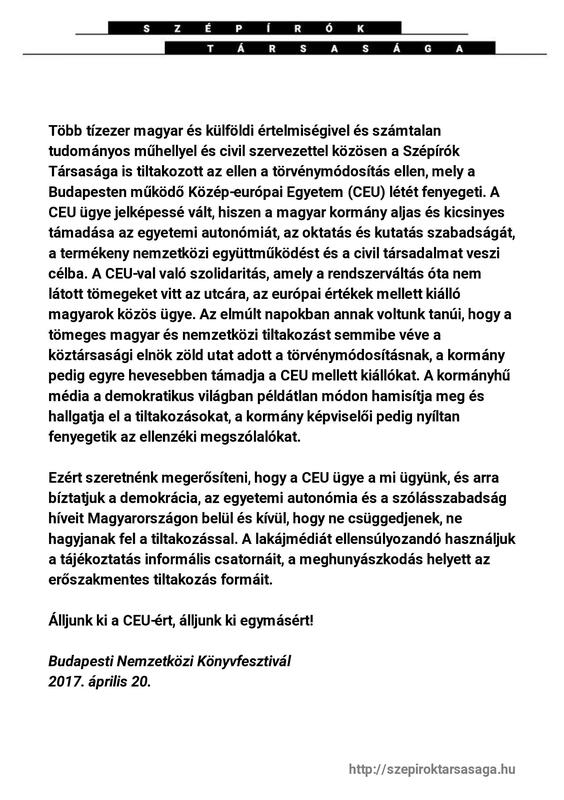 "The Hungarian Society of Writers, Critics and Literary Translators has joined tens of thousands of Hungarian and foreign intellectuals and countless academic communities and NGOs in protesting the amendment to the law on higher education that jeopardizes the existence of Central European University (CEU) in Budapest. The case of CEU has become symbolic due to the Hungarian government’s ignoble and petty attack on university autonomy, freedom of education and research, frutiful international cooperation, and civil society. Solidarity with CEU has mobilized masses unprecedented since the political transition, and it is the common cause of all Hungarians standing up for European values. In the past few days, the President of Hungary has signed the amended law despite widespread domestic and international protests, and the government has intensified its attacks on those standing by CEU. In a manner unprecedented in the democratic world, the media loyal to the government has falsified and failed to report on the protests, and representatives of the government openly threaten those in opposition. Therefore, we would like to affirm that the cause of CEU is our cause, and we encourage all those committed to democracy, university autonomy and the freedom of speech in Hungary and abroad not to despair and to continue protesting. To counterbalance state controlled propaganda media, let’s use informal channels of information, and instead of cowering, let’s use non-violent forms of protest. Let’s stand up for CEU! Let’s stand up for each other!" Read more (in Hungarian) here: http://www.litera.hu/hirek/szepirok-tiltakoznak-a-ceu-torveny-ellen-a-konyvfesztivalon and the list of signatories can be found here https://www.facebook.com/SzepirokTarsasaga/posts/1120334804778820. Find out more about the Festival here: http://www.litera.hu/dosszie/konyvfesztival-2017 or watch a video of author Gergely Peterfy reading the statement here: http://www.litera.hu/media/peterfy-gergely-laudacioja.